Delta Air Lines Inc. charged nearly $430 million—the highest of all airlines. The slightly bigger United Airlines came in second with $351 million in baggage fees. The country’s 15 largest carriers racked in $932 million in fees in the second quarter of this year, in addition to the $816 million from the first quarter. Numbers for the third quarter are expected to be the highest and will be reported in December. 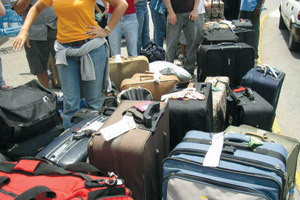 Airlines began to charge travelers for a checked suitcase in 2008 and since then, fees continue to increase. Airlines commonly charge $25 each way for the first bag, $35 for the second bag and then different additional fees for overweight or oversized bags.